In February 2014 we launched the UK’s first pancreatic cancer awareness advertising campaign. We needed it to be bold, to be taken notice of and to cut through the ‘noise ‘ of other charity advertising. This campaign won us and creative team, Team Darwin (who did the work on a pro-bono basis) TWO IPA Effectiveness GOLD Awards (the advertising industry Oscars!) in October 2014. In February 2015, our campaign was voted the 26th best marketing campaign in the WORLD, ahead of some very large international companies with huge marketing budgets. Our I wish I had campaign cost us only £15,000 thanks to the pro bono work of Team Darwin, our creative agency. This campaign reached over 20 million people in the UK alone and millions more across the globe. 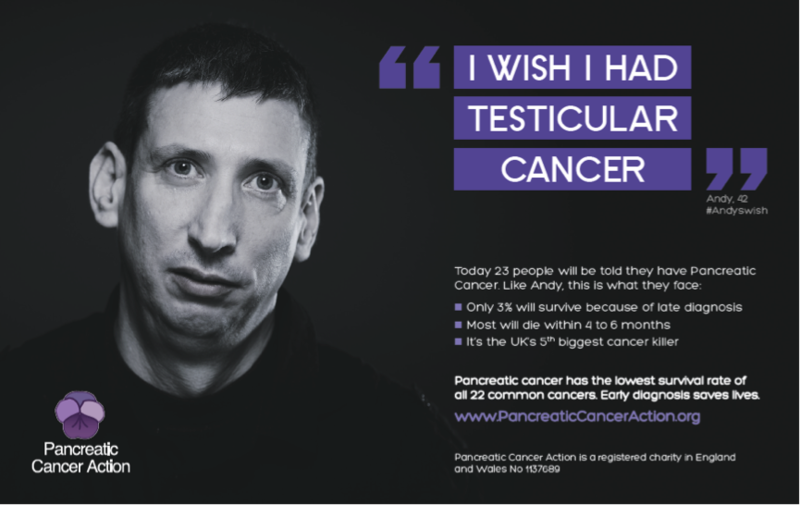 It is to date the single most effective pancreatic cancer advertising campaign globally – EVER! 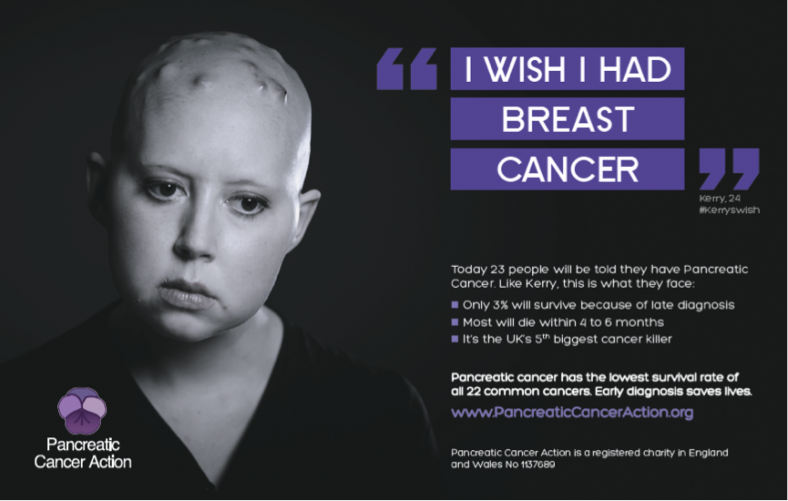 The ads – featured real pancreatic cancer patients, Kerry (24), Andy (43) and Penny (50) saying they wished they had another cancer – and presented the general public with the terrible prognosis that every pancreatic cancer patient currently faces upon diagnosis. 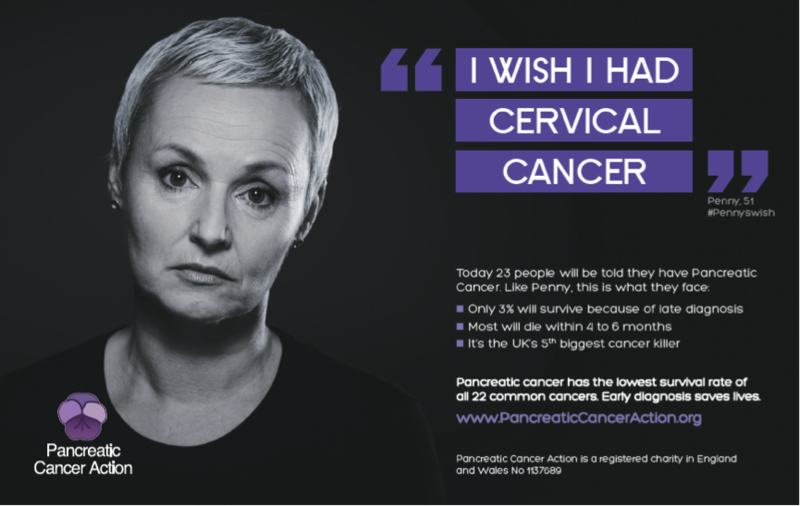 Our advert did not state that someone wished they had cancer but rather they wished they could swap pancreatic cancer with a cancer that gives them a better chance of survival. We purposely selected cancers for our campaign that have a significantly better survival rate than pancreatic cancer. Sadly, Kerry died two weeks after our campaign launch just days after a very compelling interview she had on ITV’s This Morning. Andy too died in August 2014. Both Andy and Kerry worked tirelessly to raise awareness of pancreatic cancer right up the final stages of their disease and we are forever grateful for their courage and tenacity throughout. The good news is that Penny is very much with us and, after treatment to downstage her tumour, she had surgery to remove the cancer in April. Penny is back at work part-time and is doing well.